February 10, 2012  C-sections pose a risk to preemies who are small for their gestational age, according to a new study. Those babies a higher risk of had breathing problems than babies who were delivered vaginally. January 9, 2012  Swiss researchers found that newborns who got sugar and a firm embrace suffered the least pain, compared to babies who got just sugar or who were just held during medical procedures. December 12, 2011  Even very tiny preemies sometimes turn out OK, as shown by the stories of two girls who were among the smallest preemies to survive. 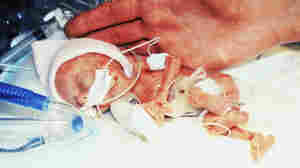 But infants born very early and weighing very little can face a lifetime of health problems.